Ouch! That smarts! Treat your minor cuts, scrapes and scratches with the incredible healing power of a designer bandage. And if a fancy bandage isn't enough to dry up your tears, how about a FREE TOY! Each comes in a 3-3/4" tall metal pocket tin and contains a small plastic trinket to help make even the ouchiest owies feel all better in no time. 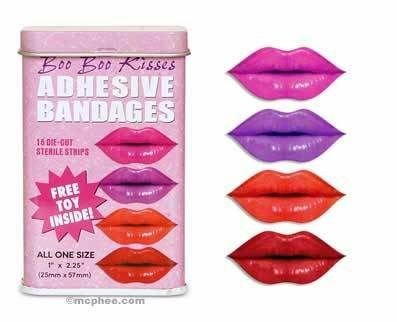 The 2-1/4" x 1" Boo Boo Kisses are cut into the shape of lips and come in four different colors. Fifteen per tin. Kisses not for you? Maybe bacon and eggs are better....or how about sushi instead? The bandages aren't cheap compared to normal ones you might buy from wal-mart for a buck or two, but for $4.95 a box, they could be a cute novelty item/gift idea or just what your daughter needs when she's scraped her knee and wants unicorns and rainbows. And don't forget, they come with a free trinket toy and a special tin box. I quite like the sushi ones. It was hard for me to decide which ones were my favorite ones. I loved the sushi ones, and for some bizarre reason, I was quite attracted to the Jesus band-aids. I say "bizarre reason" because I'm not religious at all. Thanks for stopping by Mixed Grill Favorites. Good luck posting every day this month! It's really funny that you guys both liked the sushi ones. It was actually the sushi band-aids that got me on the site and they're the ones I have bookmarked. As I got ready to write the post, though, I decided that sushi probably wasn't the biggest favorite of most people and wouldn't catch their attention, so I went with something more universal. I should've just stuck with the sushi! Lol.